One of the things I love most with hot chocolate is peppermint. Anything peppermint. 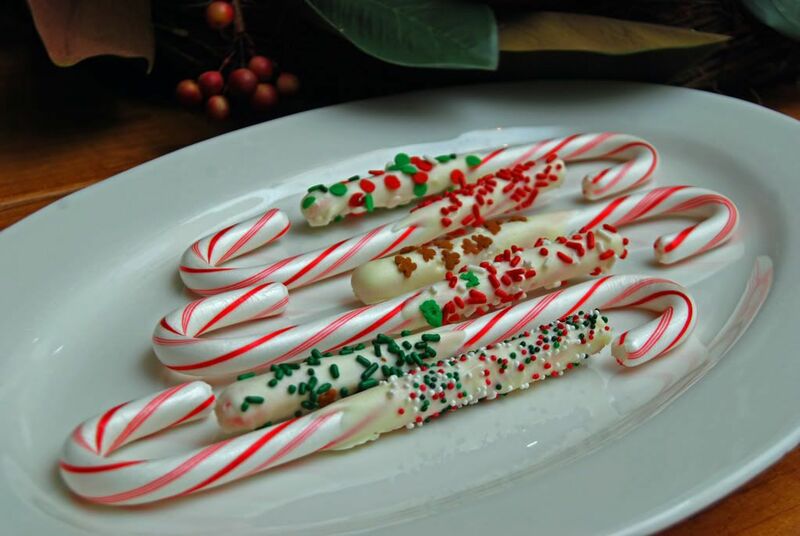 So, when I saw some chocolate-dipped candy canes at a local store, I thought, "Now, I can make those. And, they'd be awesome stirring up a mug of hot chocolate." So, today, we made these Chocolate-Dipped Candy Canes. They are so easy, and they're really beautiful and festive. I didn't want them to have a "smushed" side, so instead of laying them on waxed paper to dry (like I did with our Chocolate-Dipped Pretzels), I hung them all over my kitchen. It worked great. I thought these would make adorable placecard holders, so I quickly made one up. First, I attached a simple gift tag that I personalized to one of the candy canes. 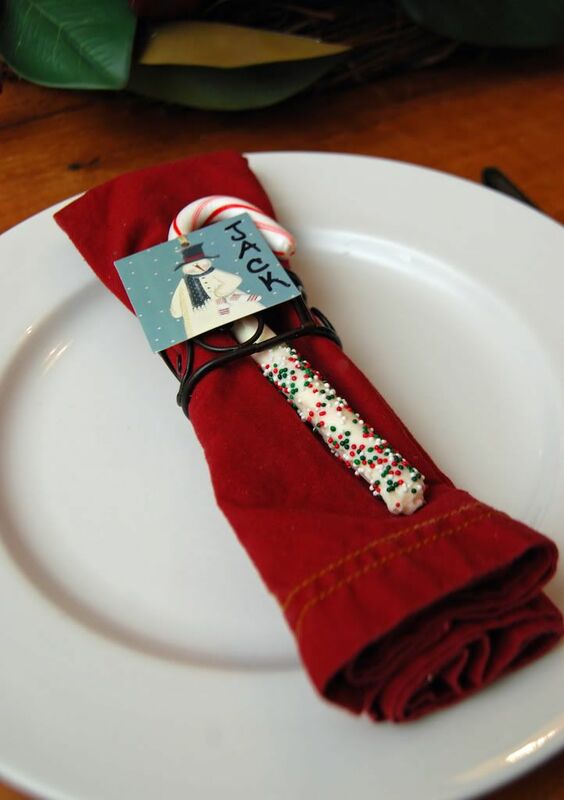 Then, I put a folded, cloth napkin into a wrought iron napkin ring and slipped the Chocolate-Dipped Candy Cane through the ring. I think it adds such a thoughtful and personal touch to a Christmas tablesetting, and gives everyone a little minty ending to their meal. Our lesson: As much as we love playing in the snow, we're so thankful that we get to come inside to our warm house and have a big mug of hot chocolate. Peel wrappers from candy canes. Set aside. Pour chocolate chips into small microwave-safe bowl. Melt chocolate chips at 70% power for 1 minute. Remove and stir. 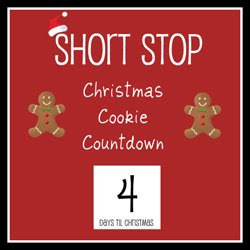 Continue microwaving in 20 second intervals and stirring until chocolate is melted and smooth. Dip ends of candy canes into chocolate. Decorate with desired sprinkles. 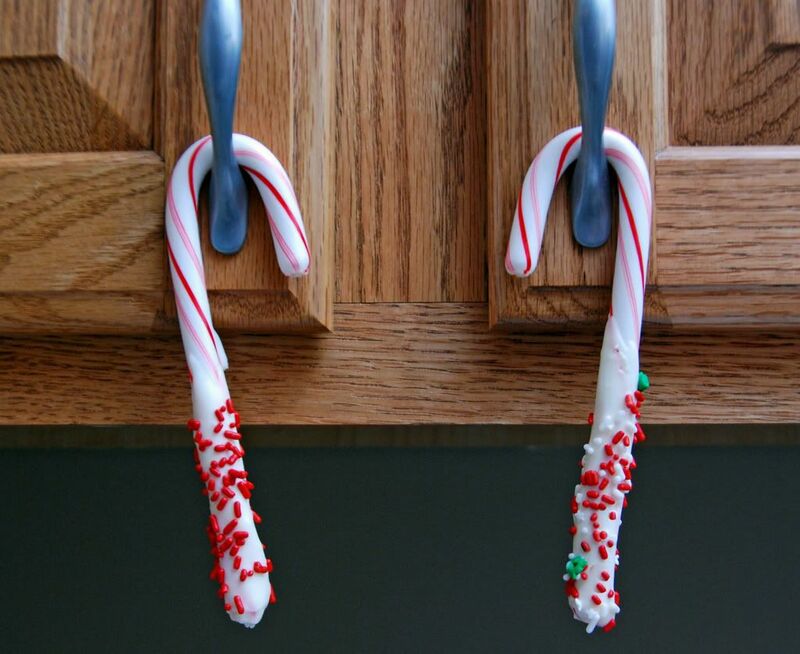 Hang candy canes to dry. Serve in a mug of hot chocolate or on platter. Really like that idea! I'll have to try it. I like mint in my hot chocolate, too...peppermint schnapps. Yum!